It’s been a looooooong winter for most of us in the northeast. A long, cold winter. So much so, that getting out has been difficult, and so much drawing and creating happened here chez nous, at ‘little cottage in the woods’. Late last fall, I embarked on a winter’s project of making a ‘deck’ of 52+1 Artist Trading Cards to be swapped with fellow CZT’s this March (more on that in a future post). 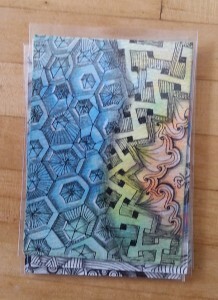 I also continued to make sketches in my little tangle notebook as I was inspired by new patterns. A tangle slowly emerged, inspired by a fascinating digital image I found on Flickr…. I loved the 3d and geometric lines, as well as the interplay of shade and light, and as I sketched this out the tangle that started to form began to remind me of the barnacles we’d walk over when vacationing on the Blue Hill Peninsula in Maine every year…. It starts with a basic hexagonal grid (and there are numerous ways of building these) but you can also start with Sandy Bartholomew‘s “Coop” tangle. 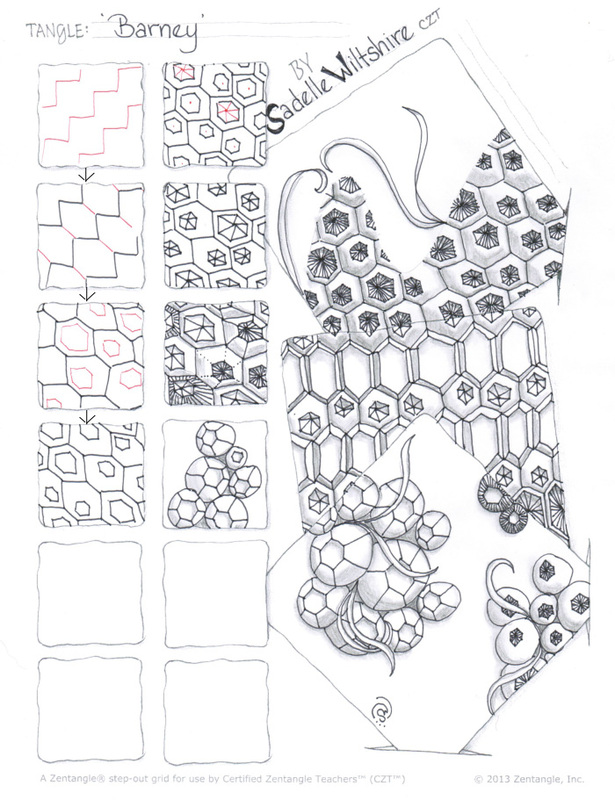 At this point everything else is just an option: I like to break up the inside of the small hexagons by making a randomly placed DOT inside each one, or some of them, and then drawing from the dot into each of the small hexagon corners. Again, be random with this.. it adds to the fun and surprise. You can continue to use these guidelines to fill in more lines, or you can stop there. 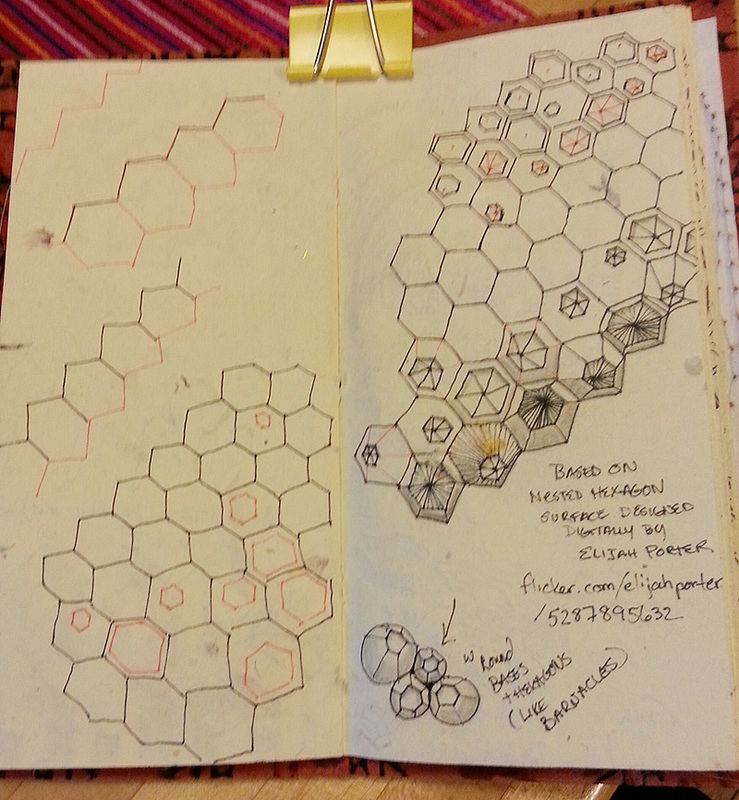 You can also draw lines from each outside corner of the inner hexagon to meet it’s outer hexagon corner. 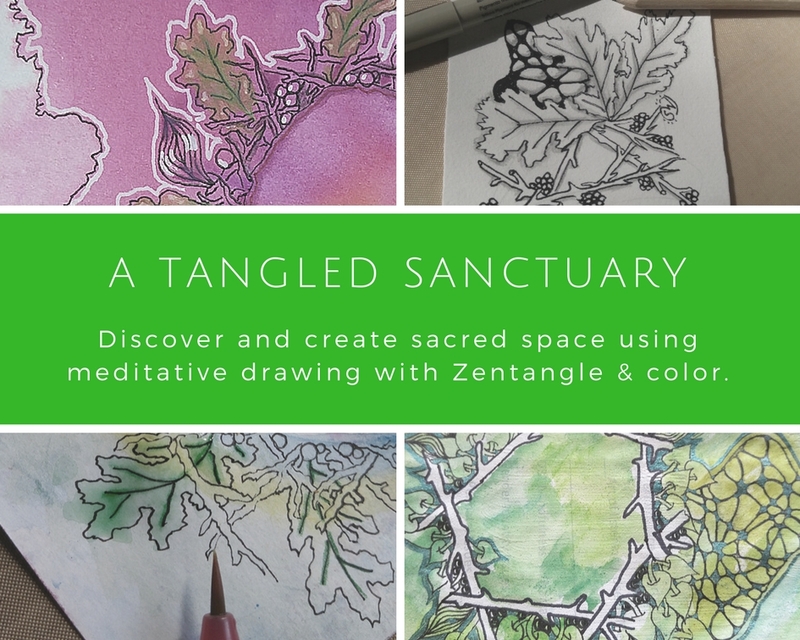 I’d love to see what YOU do with this tangle… you can go with a more organic look, or a more geometric look. It’s become one of my ‘go to’ tangles this winter, and I decided it was time to share it. Enjoy! This entry was posted in Tangles, Zentangle® and tagged highlights, shading, tangle, tangleation, watercolor, Zentangle®. Bookmark the permalink. I like this alot. I also looked up the Flikr page you mentioned. Those pictures are just begging to be tangles. 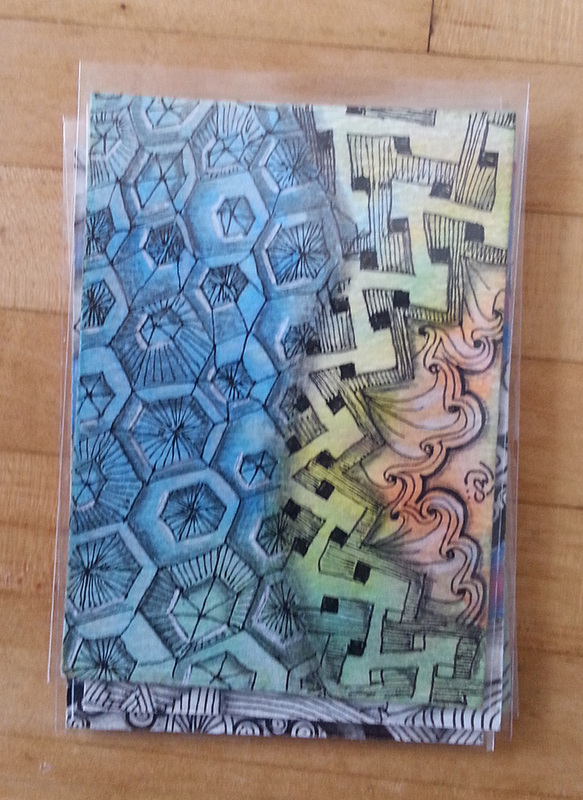 I’m putting your new tangle in my journal today. Fun! You should send it to Laura the DivaCZT for her Use My Tangle week challenge. oh…..thanks, Margaret! I will do that! And I was so sorry you couldn’t come to Tangle U. We all missed you alot. I had been looking forward to meeting you..
hey, this is fun. thanks for sharing it. Ohhh I love this Tangle! I can’t wait to play with it! Thanks, Cari! 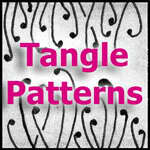 It was a surprise to find it on TanglePatterns today. Great to see you this past weekend! Brilliant! This is so versatile. Your color versions are stunning. Thanks, Antonine! I love the extra shading and highlight possibilities when tangling on toned paper or color! 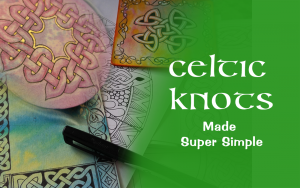 I looked at the Flickr images you referred to and was amazed to discover that these artists are really doing many Zentangles “in the round.” Three dimensional versions of what we draw. We should get together from the Yale School of Architecture and talk about this! Yes, Wanda…. patterns are everywhere! And so much in architecture. Ironic for me, as at one point in my college education, I started out as an architecture major. Who knew years later I’d return to art in a different way! I was just wondering if you’ve come across (or created!) any other hexagonal flowers similar to these or if I managed to accidentally stumble across something new – or at least unpublished? Hi Annette! Love what you did with this! I can’t say I have seen anything exactly like what you created with the rounded off petals in a hexagon, though I’ve seen a flower technique like that done with more regular/squarish grid patterns somewhere… maybe show it in one of the Zentangle Facebook groups and see if you can ‘crowd source’ your answer?